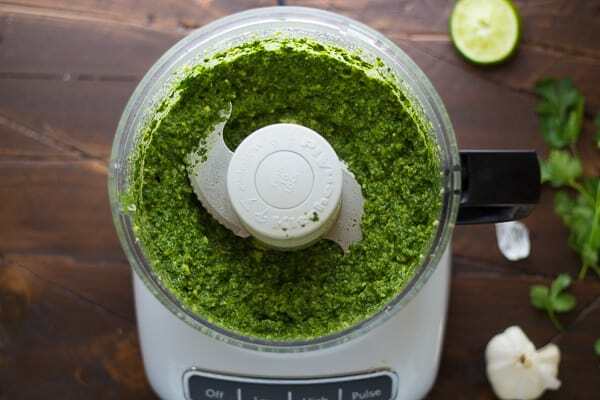 An easy and fresh cilantro jalapeno pesto recipe that replaces basil with cilantro and adds grilled jalapeños for extra flavor and a touch of heat! Slather it on fish and grill them up for a quick and easy week-night dinner! Becoming a mom has changed my life in more ways than I would have ever thought. More than the words-can’t-describe-it love. More than the sleep deprivation and those crazy days when you want to scream. 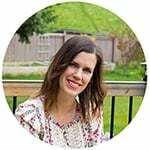 Motherhood has completely changed my outlook on life. My old priorities: career. Work hard, nose to the grindstone, get a prestigious career, buy a fancy house, have kids, do it all. I’ve recently discovered that I don’t want to do it all. Not at all. What do I want? Life to slow down. To be more present, in the moment, my brain not thinking about work when I’m at home and family when I’m at work. I want the slow and relaxed pace that life had when I was on maternity leave. So we’ve made the decision that after I graduate (sometime at the end of 2015), life is going to slow down. If we can afford it, I will work part-time. Dinner won’t be a freak-out. Week-ends will be for family time, not chores. And hopefully, I can get to the place where I live in the moment and enjoy all the wonderful things that I have in my life. OK not really, but if any pesto were to evoke deep emotions, this cilantro jalapeno pesto may just be the one. This pesto has a cool cilantro-jalapeño-lime kind of thing going on, and it is pretty darn delicious. Let me clarify that those aren’t raw jalapeños, but rather grilled jalapeños, so they get that sweeter, more pronounced jalapeño flavor going on, and waaay less spicy. This cilantro jalapeno pesto would be wonderful on a whole lotta things: pizza, sandwiches, etc, but I decided to go with fish. Specifically, white fish. I used tilapia, but it would be wonderful on all sorts of fish. Because my tilapia was pretty thin, and my barbecue has a reputation for setting things on fire (no joke), I grilled it on a sheet of aluminum foil. A few minutes per side was all it took for a seriously easy week-night dinner. We slathered ours with some extra pesto, and served it with a big salad. Hope you are all having a wonderful Monday. And I’d love to hear from parents: did having children change your priorities in life in a surprising way? A fresh and delicious remix on the traditional pesto recipe that replaces the basil with cilantro, and adds roasted jalapeños for a bit of a kick! Pre-heat barbecue to medium-high. Spray jalapeño peppers with oil, and cook on the grill, turning every 2 minutes until charred and cooked through. 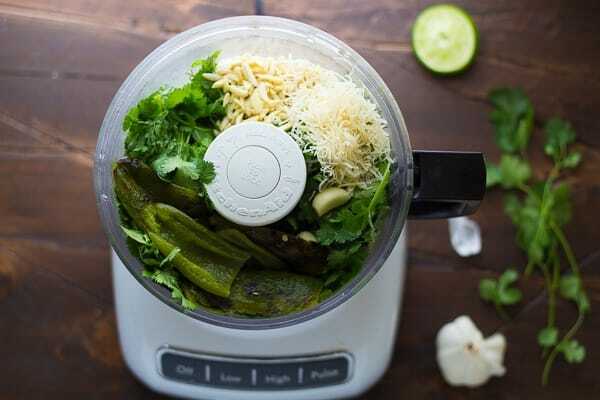 While jalapeño peppers are cooling, assemble all pesto ingredients in a 7-cup food processor fitted with a steel blade. Remove the stems and seeds from the cooled jalapeños, and do your best to peel off the skin. If it wouldn't peel, I didn't worry about it and moved on. **You may wish to wear protective gloves when handling the jalapeños. Place the peeled and de-seeded jalapeños into the food processor and blend for 30 seconds. Scrape down the sides of the processor with a spatula and blend for 30 more seconds. Spray a large piece of aluminum foil with spray oil. 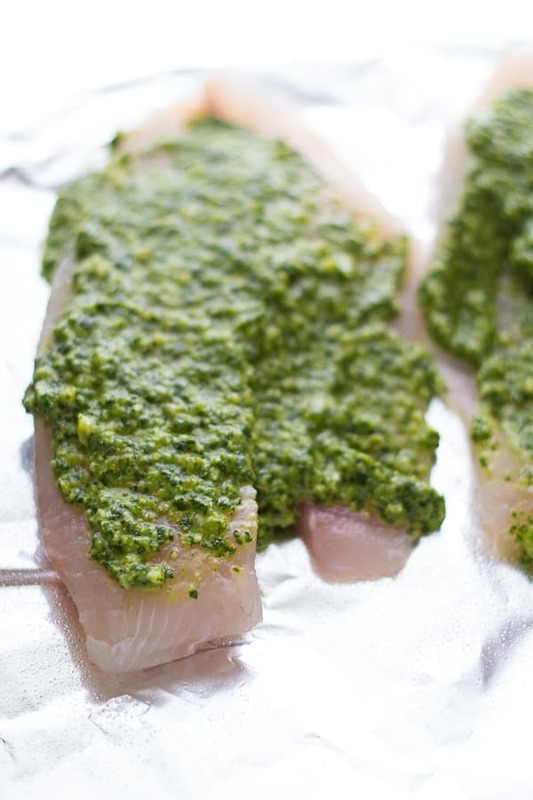 Arrange fish fillets on the aluminum, and spread generously with pesto. Cook the fish on the foil over medium heat on the barbecue. Cook for 3 minutes, then flip and cook for another 4 minutes, or until fish is cooked through and flakes with a fork. *Jalapeños vary in their spiciness, so use your judgment when preparing the pesto. Try with 1-2 jalapeños to start, taste and decide if you want the others. *depending on the type of fish you use, and the thickness of the fillets, cook times will vary. I’m trying to add more fish to our meals and this recipe was absolutely delicious. We are big cilantro fans and this pesto was so favorful. Will definitely be making this dish again soon. Hi Nancy, I’m so glad you enjoyed the recipe 🙂 Thanks so much for reporting back! Oh Denise, I love this post and totally support you 100% with whatever works for your family and makes you happy. After we had my son, I left my corporate job and my husband and I picked up and moved to a small town not know anyone here so I could stay home and just cherish these early years with my son that just seem to go by too quickly — eeks he’s already 4 now. At the time, we didn’t know if that was the right choice but after we had our second little one who is now over 15 months, we have never felt better about that decision. I have also decided to slow down with everything else to spend more time with the kiddos. Hope you are able to find balance with whatever you end up doing 🙂 Love this fish, the cilantro chile pesto sounds incredible! Wooooooowwwwww these photos are seriously so stunning! It’s making me crave this recipe even more. I’m a complete pesto addict, and I love that you used cilantro – what a delicious idea. 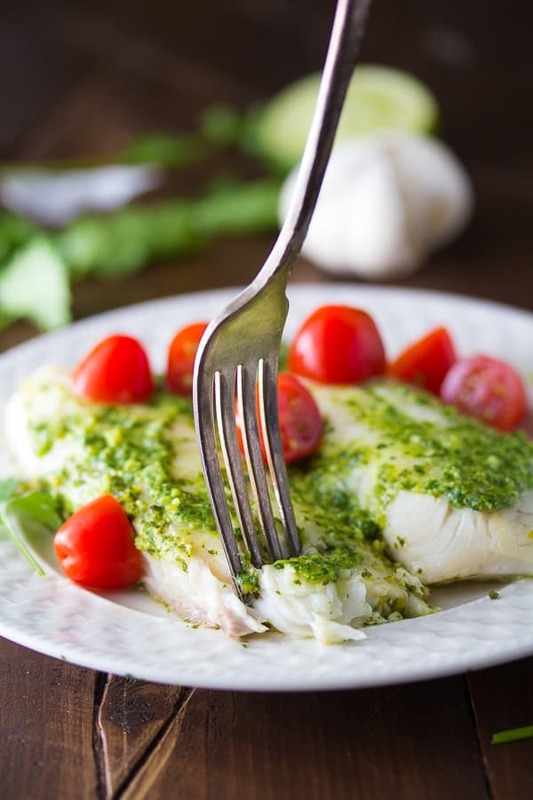 Pesto is the perfect pairing for fish, and makes such a great summer dish. I will definitely have to try this! Good for you for trying to slow down! I am not so good at that. This is a beautiful meal. I love all the flavors you have going on in this recipe! I am very fortunate that I can stay at home with out kiddos! Pesto is one of my favorite things to make! I love pesto too! I’ve never tried it on fish but I love it on pasta and chicken! I love posts like this and I can relate to wanting to slow down and enjoy life. I love this dish too, Denise! That pesto is genius! Thanks so much, Danielle 🙂 I wish there were more hours in the day! You had me at pesto! This fish looks delicious, Denise! I love the flavors in here. We eat fish often, so I can’t wait to try this out! Thanks, Gayle! We don’t eat nearly enough fish, but I’m determined that it’s going to happen more often! I support you 100% Denise! You know I’ve been there. We all need to remember it’s important to make a life, not just a living. You will find a way to make it work, and you might not have everything you want, but you will have everything you need. xo P.S. I love this fish recipe! And this fish?! Yum! We have been trying to eat more seafood so I am definitely eager to find more ways to cook it, this looks delicious! All I can say is Amen! I am slowly learning to take a step back from the things that aren’t as important and really enjoy this time. This pesto is GENIUS friend! My kids are young adults now, but didn’t get to fully appreciate all of the moments of having a young family because I was too stressed with working full-time and trying to race against the clock to get everything done. I would have loved the opportunity to slow it down and work part-time. I hope you will be able to attain that goal. I love cilantro! This pesto sounds wonderful! I would have it with everything. This is one truly stunning piece of fish, Denise! Dying over that pesto! Wow, look at that pesto! I cook fish at least once a week and love trying new recipes. The addition of the jalapeno is a great idea too! Thanks, April! I have always been feeling like 8 hours is SO long for a one year old to be away from his parents! Thanks, Alyssa! It sounds so simple to live in the moment, but it’s so challenging, isn’t it? Hugs, girlfriend! No one expects you to be able to do it all, but you’re totally a rockstar at what you’re doing right now so keep it up! (and of course, keep the wine nearby! 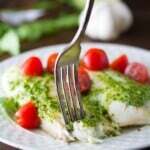 LOL) That pesto seriously sounds SO amazing on top of this gorgeous fish! My kinda summer meal for sure! Thanks, Sarah! Wine helps 😉 LOL.